“An indefensible crime against the indigenous people of Palestine!” This is what Pastor Alan Ray Sarte, spokesperson of the Philippines-Palestine Friendship Association called last March 30, Friday’s massacre of 17 Palestinians by Israeli soldiers along the Gaza border. More than 1,400 more were injured as a result of the shooting. 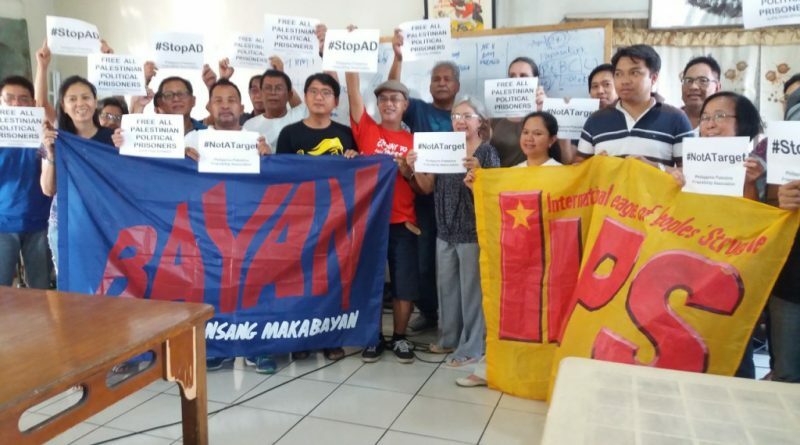 “In Israel, as in the Philippines, the ruling powers treat the indigenous people with disdain,” added Pastor Alan, “they are killed, their homes and schools are destroyed, and their lands are taken away from them.” Since 1948, the state of Israel has occupied Palestine in violation of the rights of its indigenous people. Snipers and soldiers of the Israeli Defense Forces opened fire and attacked the demonstrators who were gathered to commemorate Land Day, March 30, 1976 when six unarmed Palestinians were murdered for preventing the Israelis from seizing lands to build illegal settlements. This year’s protest is named the “Great Return March.” Tens of thousands of Palestinians came together for a sit-in demonstration along the border to call for the return of Palestinian refugees to their land. The six-week protest will culminate in the observance of Nakba (Catastrophe) on May 15. On that day in 1948, the indigenous people of Palestine lost their lands to the invading Israeli army. The Zionist state of Israel has refused to conduct an investigation of the shooting and even blames the unarmed Gaza protesters “for provoking” the soldiers. US President Trump’s declaration to open the US Embassy in Jerusalem has emboldened the Israeli government to escalate its attack against the Palestinians. The move defies a UN resolution declaring Jerusalem an international city and denies Palestine’s claim to East Jerusalem as its capital. The US embassy is set to move to its new location in Jerusalem on Israeli independence day, May 14, a day before the anniversary of Nakba. Meanwhile, the United Nations Security Council was eerily silent on the Zionist government’s latest crime against the Palestinian people.